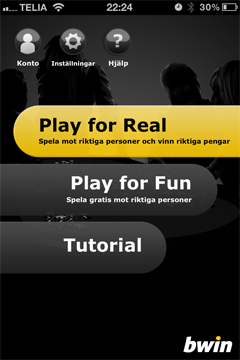 Why is bwin just copying the iPhone app when launching an iPad app? The iPad and other tablets are made for playing poker on. You can do it everywhere, on the couch, in bed, on the bus! So I had real high hopes when I downloaded the app from App Store. iPad is not the same form factor as the iPhone! The iPad app is just a copy of the iPhone app as you can see in the images below. I understand that it is very easy from a technical perspective to implement a copy of the iPhone as an iPad app. But is it the right way to do it? It is not! The iPad is a completely different form factor with its own advantages! So bwin should really design for it! I expected to be able to play on multiple tables on the iPad, as well as having a “real” lobby to choose which tables I want to play at. 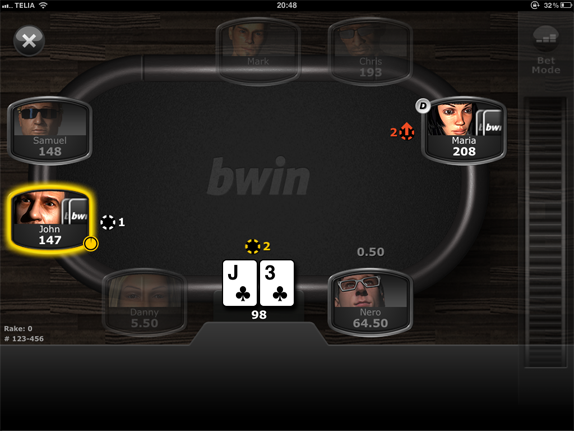 My advice to bwin is to really design from a player perspective and not a technical perspective. If done that way then I am sure that the app would not be a complete copy of the iPhone app. Image 1. Welcome screen on the iPad app. Image 2. Welcome screen on the iPhone app. Image 3. 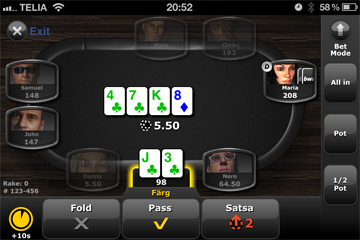 The poker table on iPad. Image 4. The poker table on iPhone.